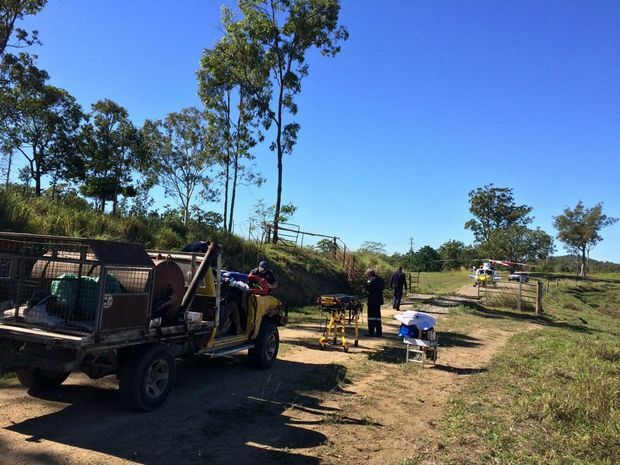 A grazier on a cattle station near Teemburra Dam is lucky to be alive after he was attacked by a mickey or wild bull on the weekend . He was seriously injured after being gored by the unbranded bull whilst working on his property. Unable to drive himself to medical care, he activated his PLB. Authorities responded quickly. After determining the grazier was working alone on the property, the CQ Rescue helicopter was immediately tasked to locate the grazier by homing the signal from the PLB or beacon. A doctor and paramedic on-board the helicopter provided emergency care on scene before the man was airlifted to Mackay Base Hospital. Police praised the actions of the injured man. His quick thinking enabled the rescue helicopter to promptly locate him and provide first class medical care. It almost certainly saved his life. A PLB is something all people who work remotely or in areas of poor mobile phone coverage should consider carrying. Many companies already mandate such a device for their employees. You may never need to use it, but you can be assured that if you do, help will be on its way. To work out the best remote communication plan for you, check out Save Our Selves – A guide to getting help in remote areas. By hamalochonline in Information, Media Analysis, Simple Survival Tips on June 9, 2016 .